Anyone who has been to Greece at least once knows the most popular Greek sauce - tzatziki, which is a frequent guest on Greek tables and a great addition Nutritious soups are usually served in winter and are rather an independent main course. The presented vegetable soup with the addition of xinochodros is tasty but completely different in taste than traditional Polish vegetable soups. It is also simple and fast to prepare. And in addition to xinochondros it does not require any other Cretan specialties. Recently, we wrote about xinochondros, or a specific Cretan product made from wheat grains and sour milk. 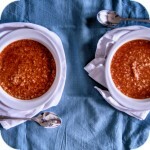 Today we will present the first method of using xinochondros in a very simple and surprisingly tasty tomato soup. Its bready and slightly sour taste makes it completely different from our soups. Fakes is a popular Greek soup prepared on the basis of lentils. It is quite dense and filling, so it is especially happy to be served during the fast preceding the Greek holidays. In our climate, it will definitely work during winter and autumn months. Fasoláda is a Greek bean soup considered one of the most popular soups of this country. Fantastically suited for winter days, because it is thick, warming and filling. Despite the fact that it is not cooked on meat, and its main ingredients are only vegetables, this soup is delicious, full of flavor and aroma. In our home, it has permanently entered the canon of favorite soups. Tomato sauce for spaghetti by adding mastic takes on a different taste. Of course, this is not a traditional Greek dish, addition of the recently fashionable mastic makes this dish a part of the canon of contemporary Greek cuisine. Of course, to prepare them, it is necessary to have several crystals of this resin, because without this addition it will be a simple tomato sauce. Each kitchen in the world has its own way to tomato sauce, but the most important difference is in the spices that the individual nations spice up the simplest and best of sauces. The variety of spices that are popular in a given region of the world is also landing in a tomato sauce every day. We love tomatoes in absolutely every form, so every day the sauce made from them reigns in different forms.